Back in March there was an announcement that the Final Fantasy orchestra known as Distant Worlds would be performing in Miami, so I purchased tickets the same day and eagerly waited 8 months to see the first orchestral production of my adult life. (Disclaimer: I saw an orchestra when I was 7 but have long since developed an appreciation for music) The four hour drive to Miami wasn't too bad and by the time we arrived, roughly an hour and thirty minutes before the performance, over a hundred people were already waiting outside the building dressed in sharp suits, nice dresses, cosplay, and the occasional person in regular day-clothes. As the event was a special date for my girlfriend and I, and as Distant Worlds is an orchestra, we opted to dress sharply which fit in with the population, generally made up of people in their 20's and 30's. We brought our 3DS, which many other well dressed people openly sported, and were not disappointed when we acquired 50 or 60 street passes before the doors even opened. It was a truly classy gathering of nerds. We were briefly interviewed for a website, got our tickets from Will Call, picked up physical copies of the Distant Worlds I & II CD's and found our seats near the front of the stage. As we chatted and watched the people around us, as one by one musicians slowly took the stage. The musicians seemed generally older, in their 40's or 50's perhaps, and my mind spun as I heard them each practicing parts from various songs that have been ingrained in my subconscious for decades. I heard a brass instrument practicing Man with the Machine Gun, a violin play a part of Clash at the Big Bridge, and for once in my life, these people were actually practicing the songs I thought I heard them practicing, not simply something that sounded similar. As the stage nearly filled I noticed a man in a man holding a violin who the other musicians seemed to look at for cues. I suspected that he was the local coordinator for Mr. Arnie Roth, the conductor of Distant Worlds. I was once told that orchestras don't generally physically travel from show to show, but that a few key members do, and that the rest of the performers are locals who specialize in being very good at learning and performing the music of another conductor. This seemed to add up, because most of the musicians looked local (as opposed to from Japan or Stockholm), and the excitement on the face of the coordinator was plain to me. It seemed like he'd been waiting for this day for a very long time and was proud of his orchestra. As a performing musician I was overwhelmed with the sheer volume of instruments on the stage. An entire music store worth of string instruments, a drum set, brass section, wind section, and a harp! I silently contemplated how difficult I thought it was to arrange a song written for the 4 layers of a Nintendo cartridge to fit a 5 or 9 piece band, much less an orchestra of that size. 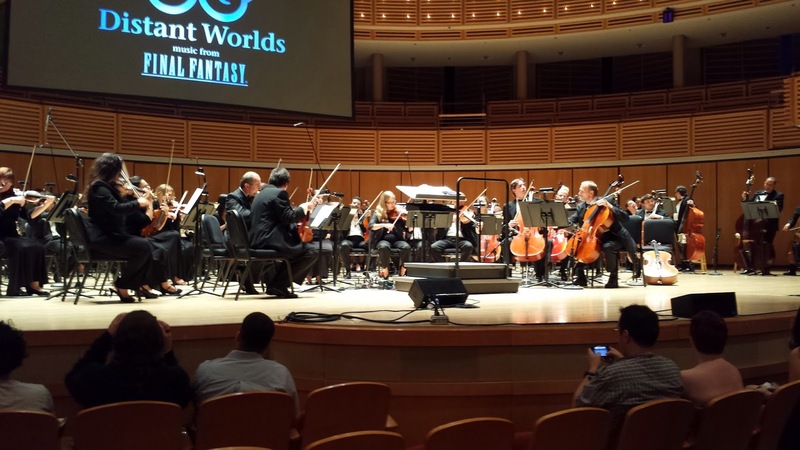 In one brief moment, seemingly out of nowhere, Nobuo Uematsu took to the stage and the roar of cheers was almost deafening, pulling me from thought. As Uematsu walked back stage and Arnie Roth took the main stage there was more cheering, midst Arnie's calm but proud (in the good way) introduction to the music and the orchestra. For those of you who don't know Arnie Roth, he's the guy who put together Distant Worlds, Play! (a video game symphony), and is involved with the band Mannhein Steamroller (do yourself a favor and check out Creatures of Levania). He's also collaborated with many well known video game composers and is known for staying true to the composers and to their music. Though most of the audience didn't notice until he was formally acknowledged, Uematsu himself humbly sat in the 10th or 15th row of the general audience to watch the performance unfold. After a moment of powerful silence the first song began, a medley of songs from Final Fantasy 1 through 4 called "Medley 2002." The music, the combined efforts of dozens of talented musicians working in perfect tandem, was truly magical in quality. It's a shame that words like "masterful" and "perfect" are as overused as they are within our modern vocabulary because they truly describe what I saw and heard. This talent, combined with the fact that the songs being performed were incredibly important in me personally caused me to literally tear up and miss out on the well executed video that accompanied the first medley. 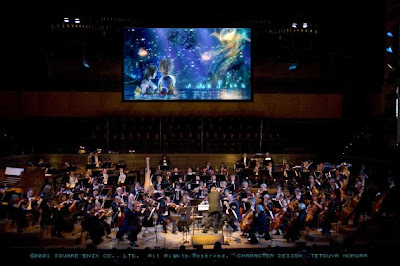 I should mention that the videos throughout the evening were a mix of concept art by Yoshitaka Amano, gameplay, and cinematic footage that fit the theme and game of the music being played. A list of songs I can remember being played include the Medley 2002 (which includes the FFI: Overworld theme and FFI: Matoya the Witch), FF IV: Battle with the Four Fiends, FF VIII: Eyes On Me, The Final Fantasy Victory Theme, FF VI: The Phantom Forest, FF X: To Zanarkand, FF XII: Kiss Me Good-bye, FF VII: Opening - Bombing Mission, FF VII: Aerith's Theme, FF XI: Vana'diel March Medley, FF VIII: Man with the Machine Gun, FF IX: Melodies of Life, FF V's Main Theme: Ahead on our way, FF VIII: Don't be Afraid, A Chocobo Medley that included what I think was Mambo de Chocobo, an amazing new Battle Medley that included Clash on the Big Bridge, Fight With Seymour, and FF VII's Battle Theme (Which Arnie called Still More Fighting), and the Final Fantasy Main Theme (the Credits roll). Highlights for the evening included first class performances by Susan Calloway (the singer songwriter who Nobuo Uematsu personally hand picked to work with), a completely unexpected arpeggio added to the Phantom Forest, and the entire battle medley (which was amazing). In one of the most beautiful songs of the evening Nobuo Uematsu himself came on stage to play keyboard as Arnie Roth played lead violin for what we were told was the world premiere of Distant Worlds' FFVI: Dark World. It was hauntingly powerful and it's the only rendition of the song I've ever heard outside the game. Another pleasant surprise was an encore of One Winged Angel where Arnie informed us that they didn't have a choir so the audience would get to sing lyrics with Uematsu himself! It was a larger than life moment where not everyone was sure if he was joking or serious. It wasn't until the end of the first chorus that most people actually started singing but the underlying message was clear... Distant Worlds would not have been possible without the support of the people in the audience, or the greater audience that's supported Square Enix's fantastic franchise, Final Fantasy. 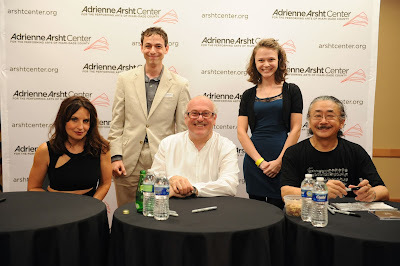 There was a lot of excitement in the room (two people got engaged during the show, earning a cool thumbs up from Arnie), and though those present were from many walks of life we all shared in a common interest, a passion for the music of Nobuo Uematsu. Sitting so close to the performers I was able to occasionally hear Arnie humming parts of the songs aloud, see the growing of a subtle grin on the face of the coordinator (the gentleman with the violin) each time the audience cheered, the sound of Nobuo Uematsu solo-whistling the Victory Theme, and the words that were spoken that didn't reach the microphone. Words of congratulations between Arnie, Susan, Uematsu, and the coordinator. Words of thanks to the audience that never reached the microphone. Kaitlin and I were able to meet and congratulate the trio after the concert, still glowing with joy (which is amazing considering Arnie had been conducting for over two hours!). They signed our CD's, took a picture with us, and thanked us for coming to see the show. Having an appreciation for what Arnie had put together, for Susan's talent, and for Uematsu's profound influence on my life, I wanted to say more but I completely choked up upon meeting them and instead of "thank you for one of the best nights of my life" I was only able to get out the words "thank you." Before I knew it, we were already out the door, back in the car, back on the highway, and back home. 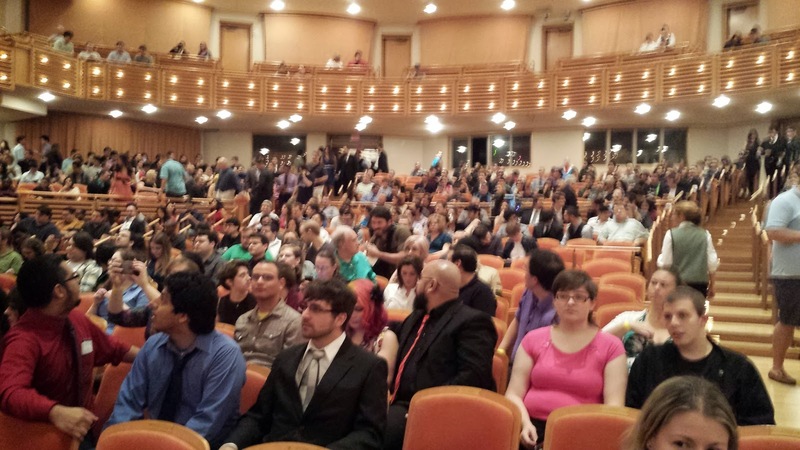 Distant Worlds Miami was an experience I will never forget and one that I hope many more people will get to enjoy. All art belongs to its respective owners. Watermark theme. Theme images by bopshops. Powered by Blogger.